Big day on Monday, the cousins finally met each other. 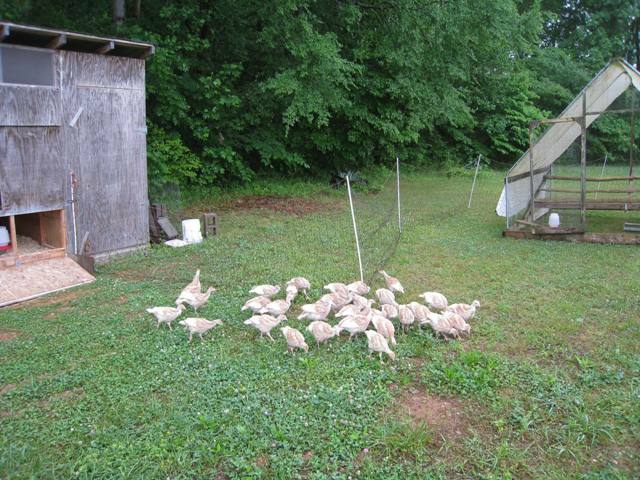 The Broad Breasted Bronze turkeys turned five weeks old and graduated to the field. Most turkey moving days are fairly quick as we just open the fence between them and the next field and they just head in there with a little herding. This one is always more complicated. It takes extra fences, multiple groups and shelters to be moved farther than just the next paddock. In general the pattern is to move the flock from the bottom of the farm to the top, always trying to move up hill into clean ground. Hard to do sometimes when the cash crops are in the ground. The Bourbon Reds have been hanging out the last two weeks in the lowest production block with the first zinnias of the season (no longer being cut) for shade. They were going to meet in the Blueberry field. First we set up two net fences, in a U shape, around half the Blueberries to herd them into. 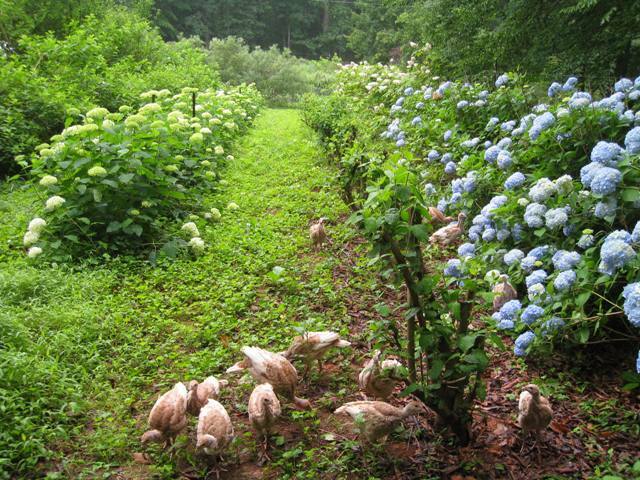 Next open their existing fence and herd them past the basil, through the “Stand” and Betsy’s flower beds, across the driveway and into the new enclosure. Next take down the net fences that have surrounded them and erect them around the rest of the Blueberries and the open end of the U now holding the Bourbon Reds. They are so happy rooting around under the bushes for new eats that they don’t even know the “door” is actually not there! Onto the Bronzes, we take the big truck with shell and back it up to their temporary paddock in front of the brooder and catch the 66 little fat birds one by one and put them in the bed of the truck. Slowly we drive across the farm and back up to the net fence surrounding their half of the Blueberry field and grab them again, one by one, and set them down into their new “big” home. Finally we drag the shelters from their respective locations to the end of the berry block, move all the feeders and waterers up near the shelters, set up the water hose and fill waterers. The Bronzes, being totally wide eyed at the big world have just hunkered down under the first blueberry bushes, far from their shelter and waterers. It is quickly headed to the 90’s today so we slowly herd them up the field to their food and water so they can find it, “OK now we are home” they say. Done. For several weeks now, the country cousins and the city cousins will run up and down the blueberry field with a net fence between them, staring and talking to each other. At some point we will run them together and hope that it will be a happy family reunion and not a gang fight. We’ll see. 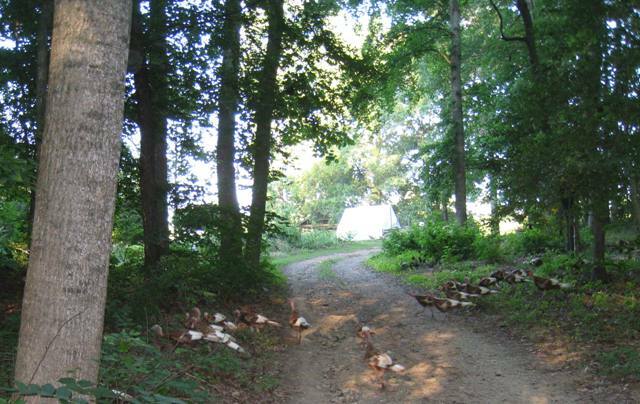 Don’t forget the next two Peregrine Farm tomato/food events this coming week. First up on Sunday afternoon is the A Southern Season Cooking class, Tomatoes From the Vine with Marilyn Markel and heirloom tomato guru Craig LeHoullier. Craig is the one who introduced Cherokee Purple to the world and is a wealth of tomato knowledge. These classes are always fun, relaxed and the menu looks great. Monday night is our Panzanella Farm dinner, still working with Jim on the menu but it will feature both tomatoes and peppers in special dishes that will be in addition to the regular Panzanella menu. This is always a nice evening with lots of locals and market regulars coming into the restaurant. Maybe we’ll see you there. July is a tomatoey month. Sure there are other fruits and vegetables out there to eat but the real focus of the month is all things tomato. We have four tomato dinners and events on our schedule alone, plus our tomatoes are featured on the menus of at least five local restaurants. It is a lot of pressure to put on just one crop from the farm and I do have to give plenty of praise to Betsy’s lisianthus and celosias as they are a big part of our business this month too. The first dinner is actually tomorrow at Foster’s Market in Chapel Hill. Foster’s Farm dinners are family style and the menu looks great, why not let someone else cook when it’s this damn hot? Betsy and I will be there to visit and talk tomatoes, we’ll see you there. Through out the month we will be carefully making sure we have enough fruit to cover all of these events and the restaurants. On top of all this we have to ship tomatoes to Alabama next week as part of a fundraising donation we did for the Southern Foodways Alliance! We have never tried to ship tomatoes before, somehow we need to make sure they don’t arrive as juice! Hopefully this continuing heat won’t cut production short. It was turkey moving day yesterday and it seemed uneventful until this morning. We move the birds to new fields every two weeks or so depending on how big they are (how much manure they will drop) and when the next field they need to move to is ready. The past few weeks they have been down around one of Betsy’s recreational flower beds with shade under some ornamental trees. 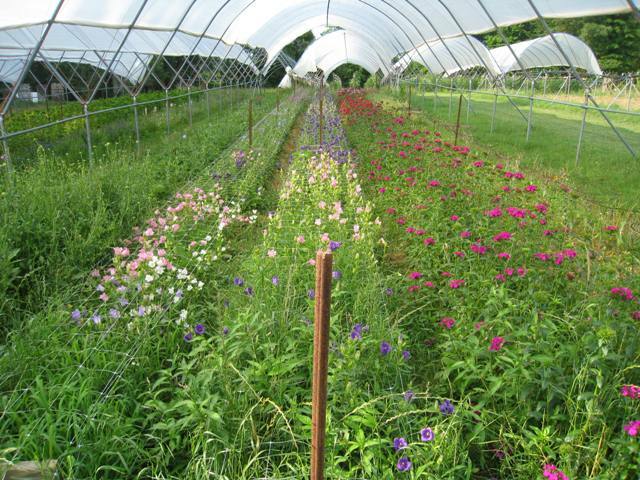 We moved them right next door to the field that had the onions and the first zinnia planting. The old zinnias provide them shade but not as much fun as hanging out in the trees. This morning I could see from the office window that a couple of birds were outside of the fence. Not unusual in the morning as they first stretch their wings. Betsy comes in and says we have a mass escape, sure enough 26 birds decided to sleep in the trees last night instead of on the roosts in the shelter, should have shut them up last evening to make sure. Fortunately they were all happy to run through the woods and then be rounded up and herded back into the fence. I’ll make sure they stay in tonight! So what else is there to talk about other than the heat!!!! We are looking at the hottest June on record unless some wild cold front blows in next week. Luckily we are at that point in the season where there is not a lot to do as far as planting, or greenhouse covering or other hot jobs. It can really be strategic early morning harvesting or weeding and watering and then slip back into the shade or the house. It is a little hard on the staff because they are not getting as many hours in as they would like but then their quality of life is probably better for it. So far the heat has not affected any of the crops, just the attitude of the farmers. It might sunscald some tomatoes in the little tunnels if it keeps up but we’ll just have to wait and see. Tourist season has begun at Peregrine Farm National Park. Last week we hosted the summer interns from the Center for Environmental Farming Systems in Goldsboro. Folks from all over the country and Uruguay here to learn about sustainable ag. Only one of them really thought they might want to be a farmer, the rest were interested in some kind of work in agriculture or “food systems”. I find it encouraging and interesting that they are now studying food systems in college as just a few years ago it was a new concept and phrase in the farming community. Maybe change is upon us. Betsy also met and toured with an Afghani woman who was here to see small farms and marketing examples to take back to Afghanistan. She works with mostly women growing vegetables on small farms near Kandahar and selling to all the foreign workers there as well as the local population. Like politics, sometimes all marketing is local, you have to work with the situation at hand. 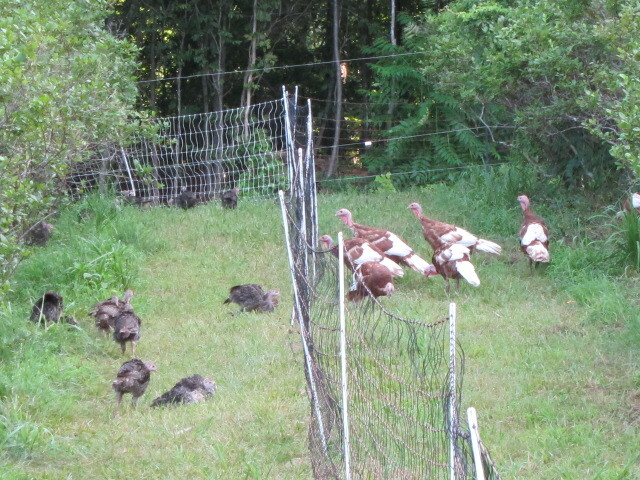 The new turkeys are, so far, the healthiest batch we have ever gotten. After a week they are all happy and growing like crazy, haven’t lost a one. The older Bourbon Reds, now ten weeks old, seem to have hit their stride and are now running around one of Betsy’s “recreational” flower beds, waiting for the first batch of Zinnias to be finished so we can move them into their first real production field to eat bugs and spread manure for us. As long as they have shade and water they handle the heat better than the humans. Late newsletter as the phone rang at 6:30 this morning just as I was sitting down to write and it was the post office with the next batch of turkeys. This group are the Broad Breasted Bronzes, the Fat Boys as I call them. This breed of bird was the first step, back in the 50’s, from the standard or heritage breeds like the Bourbon Reds that we already have out in the field, to the monster broad breasted white turkeys that are the standard of the industry now. The reason we raise this kind, as well as the heritage breeds, is because they will grow to more than 15 pounds, which is about as big as the Bourbon Reds ever get. Some folks just want a bigger bird for Thanksgiving. We think that the Bronzes are better adapted to being raised on pasture than the big whites too. 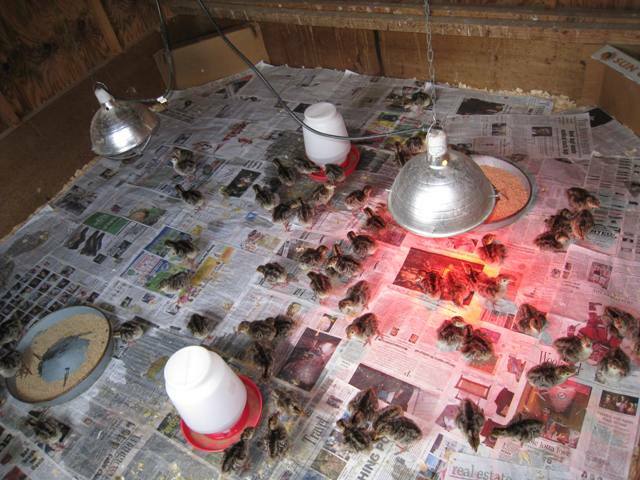 67 very energetic poults are now running around in the brooder, one forgets how much noise the little guys can make. As soon as we got them installed we moved on to covering the last of the Big Tops so we can plant the late tomatoes under them. Perfect timing as we have had a nice inch plus of rain over the last few nights and so the soil will be moist to begin the new plants in. This last planting of tomatoes is smaller, only four rows of mostly Big Beef reds and Sungolds as that is what has done the best for us in the hot days of August. The rains have also brought up the freshly seeded cover crops, we haven’t had this kind of conditions for summer covers in many years now. We are trying to make the best of these beastly humid and hot days but it is hard to have a great attitude at times! We were talking with Sarah Blacklin, the Farmers’ Market manager, last night about our new electronic benefits transfer (EBT) program at market. This is the program we got a grant for to implement the electronic food stamps system and it has gone so well we are now receiving more EBT sales than almost all the big markets in New York City! Part of this success is we modeled an incentive program that other markets have used which matches up to $20 of tokens with $20 of EBT tokens. This matching helps get EBT recipients used to coming to market and shopping in a way that is different than normally do. It has been so successful that we have already gone through the $2000 allotted in the grant for it. We are now looking for donations to help continue to build this important food access program. If you are or know folks who might be interested in donating to this program you can speak with Sarah at market or contact our program coordinator, Sabrina López, at sabrilopez@gmail.com or 561-901-0569. As a program sponsor, you will be listed on our website, facebook, ongoing media alerts and in our market materials at the market Information Booth. 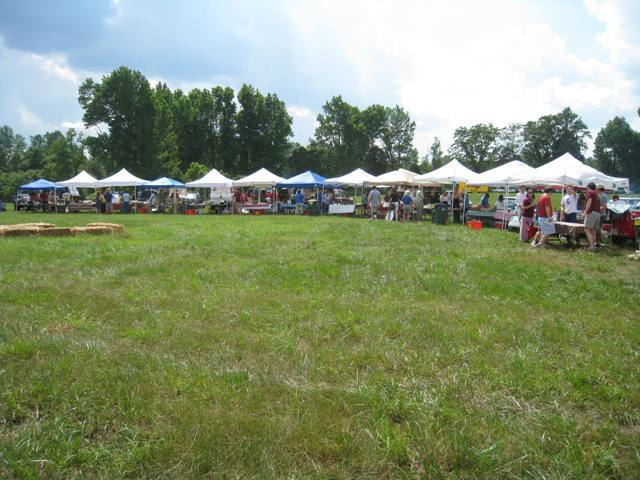 We hope to continue to be leaders in the area for food access and innovative farmers’ markets. The other part of the change from spring crops to summer crops is the planting of the summer cover crops. The rains of the last few weeks has made the soil a dream to prepare as the disk cuts the ground easily. Sunday I disked under the spring crop residues in the areas getting a summer soil improving crop and yesterday I spun out the cowpeas and soybeans that will fix free nitrogen and then covered them lightly. Today I will spin out the millet and sundangrass seeds on the different blocks and the job will be done, hopefully we will get a little rain in the next week and they should come racing up. Mow, mow, mow. Some parts of the farm only get one or two mowings a year, and with all the rain recently, the grass in those areas shot up shoulder high. I spent almost five hours yesterday cutting just the very top sections of the farm and the majority of the bottom field. Much of it I had to creep along in a low gear so the mower wouldn’t bog down. Some of this mowing is just defensive so we can keep the weeds and trees at bay. The less used areas are also the hiding areas for the crop eating varmits, especially the groundhogs. The groundhogs must have really had a good year last season because there are a lot of them and they are not afraid, yet. So far this spring we have dispensed with four and there are at least two more working. The mowing will make it much easier for me to spot them now. Now that the record short blueberry season is over the staff is getting caught up on other projects. It is major trellising season as many crops have had that growth spurt they put on when their roots really get established. Tying up tomatoes every week, the lisianthus is now over a foot tall, the peppers have gotten tall and floppy. The guys got the first set of support arms on the peppers and today we will run the lower strings to help them stand up straight against storms and to better carry a big fruit load. 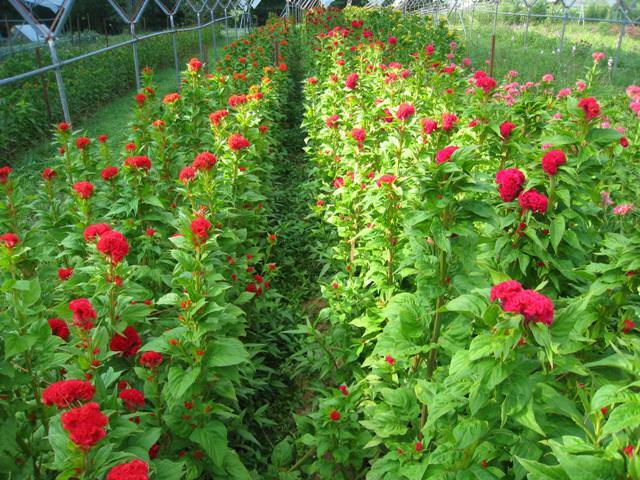 Weeding and cultivating new zinnias and celosia, planting more late season flowers, lots to do. Thankfully the sun is out today. We need a little drying time to be able to get some things weeded as they are growing before our eyes. Those little weeds and weed seeds had just been hangin’ out during the dry spell waiting. 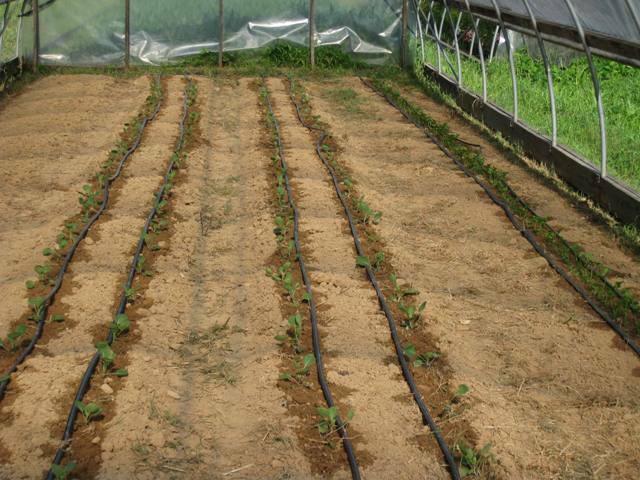 The soil temperature was warm enough, they just needed to have a little water to get going. Wow, here they come! I am afraid to tell the staff what is in store for them today, at least it won’t be too hot to be out hoeing and pulling weeds. 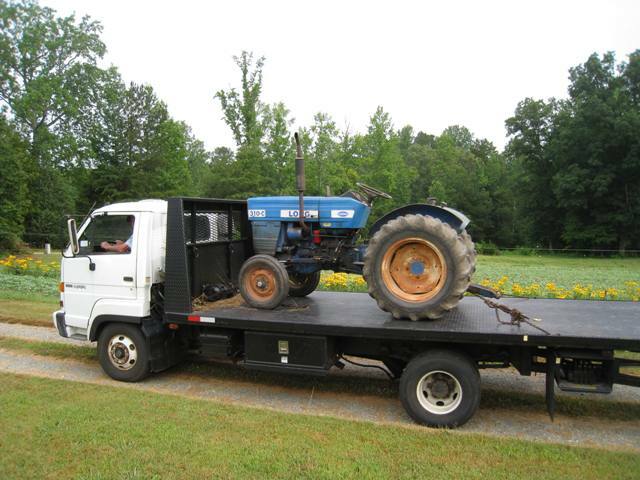 Fortunately we have enough blueberry pickers right now so that the guys can work on the other farm chores. 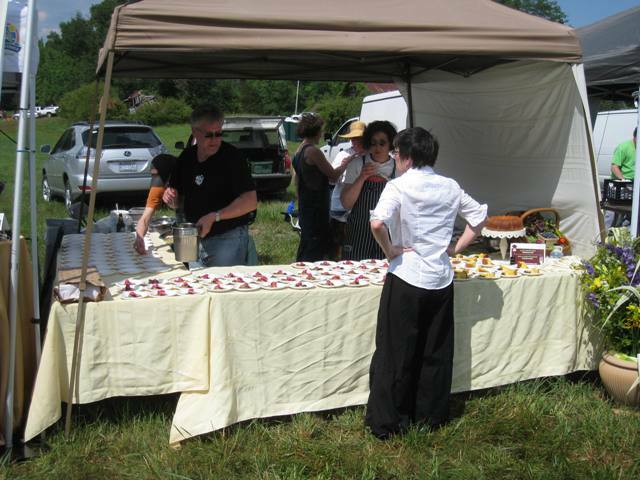 Farm to Fork was big success. The skies dumped rain on Sunday morning but by the time we all got to the field it was puffy clouds and blue sky. The ground was a bit soggy to start but dried quickly as we finished setting up for the event. The event coordinator and the volunteer coordinator had done a meticulous job and everything was totally ready when we arrived at 12:30. Slowly the other farmers and chefs began arriving and what was just a hayfield bloomed into a farmers market/festival site in a hour or so. Ben and Karen along with their skilled assistants (Amanda Orser and Shelley Collins) arrived and began assembling a beautiful and complicated dish. Much slicing and dicing and arranging on the plates. First a lettuce and spinach sauce/soup ladled on the bottom, then two sugar snap peas, an arrangement of wedges of three colors of beets, radishes and turnips. 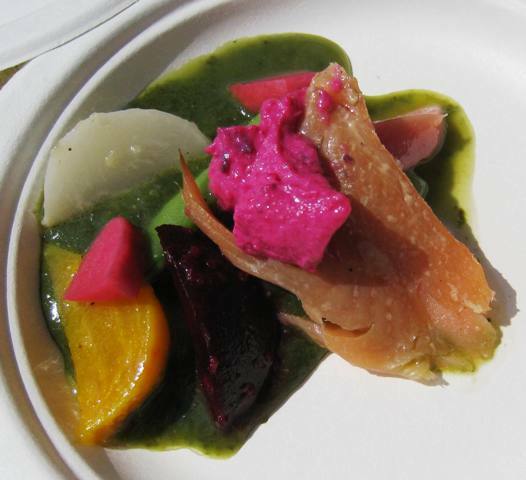 This was capped with a piece of Ben’s perfectly smoked trout and then a day-glo dollop of fresh ricotta cheese with beets to give it the wild color. We heard much oohing and awing as people ate. Of course Karen’s blueberry compote on cornmeal cake with sorghum buttermilk cream was the ace in the hole to finish them off! We all had a great time and I think the attendees did as well. It was too much food and it was hard to get around to all the tents. With the silent and live auctions we raised somewhere around $20,000 for the apprenticeship and new farmer programs at the Center for Evironmental Farming Systems and the Breeze Farm. Thanks to all who participated.